As you know, I am working to be more creative with our veggies. So far I’ve made Bacon and Ranch Roasted Cauliflower and Caramelized Brussels Sprouts with Bacon Pieces. Today I bring you Oven Baked Asparagus Fries. 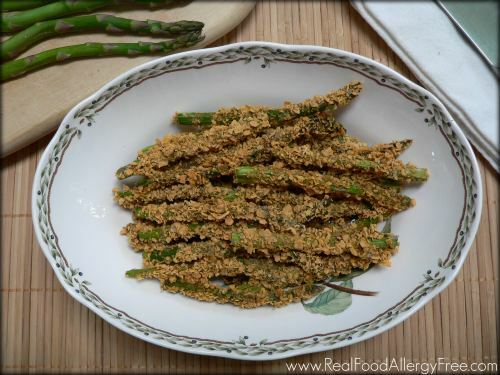 These savory asparagus are crispy on the outside and tender on the inside. They are kid–friendly. You can pick them up with your fingers and dip them in ranch if you want. Adults will find them tasty enough on their own. You’ll have to click on over to Passionate Penny Pincher to see the actual recipe! « Make a Fruit Rainbow for St. Patrick’s Day! Yum Nancy, can’t wait to try this…although we’ll go the rice chex route to keep it corn free too! Pinned! I planned to try rice cereal, but at the last minute I switched. Let me know how it works for you. did you use a flax egg? I used a chia egg, which theoretically should work the same, but it was a dismal failure! The ‘egg’ just slid of the spears so there was nothing for the coating to adheare to. I did the best I could, and I cooked for only 20 minutes and the asparagus was soggy by then. Going to to try the egg wash and maybe a bit more fat to see if that works…..
Hi Tessa, I experimented with these tonight. I made a batch with flax eggs and a batch with real eggs. I actually found the flax eggs (per the recipe linked) coated better. I cooked it only 15 minutes. They were crispy on the outside and tender on the inside. If you try them again use the flax eggs and make sure you don’t over process the corn flakes. It is the corn flakes that make the outside crispy. Oh, make sure your asparagus are dry when you dip them in the flax eggs. This looks great. With a dipping sauce, I can see my kids going crazy for these! These look really really good- I may have to try these! Thanks for sharing! I found you through allergy free Wednesdays! Thanks Zoe! Glad to have you here! I have a wee bit of flax left (flax is one of my sons IgE allergies) so I will try another small batch tomorrow. I used rice chex and made it panko texture, not fine.